UHF DSP AL21 PACK SOLO Prodipe Wireless dynamic Mic vocalist. Use the new UHF B210 DSP, Digital Signal Processor (DSP) technology. Ready for the mic's 21 series AL21, Use the new UHF DSP AL21 PACK SOLO to your AL21 instrument mic to reproduce the musicality of your instruments and turn wireless into wired! 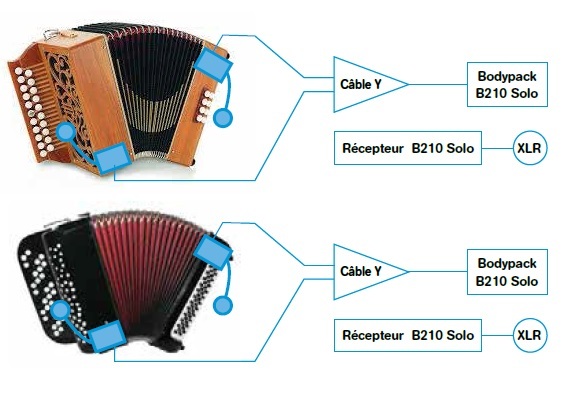 Prodipe AL21 Romanelli Accordion instrument mic set a fully adaptable mounting system, to develop 3 flexible clamps. The AL21 Romanelli Accordion mic pack optimizes the sound of the accordion on a PA system. We have chosen to use a unidirectional capsule. Clamp(s) and XLR adaptor are supplied for wired mic use (48V phantom power supply required). UHF B210 DSP Solo Prodipe Wireless dynamic Mic. Use the new UHF B210 DSP, Digital Signal Processor (DSP) technology equipped, to reproduce the musicality of your instruments and turn wireless into wired! Ready for the mic's 21 series, Use the new UHF B210 DSP bodypacks to your SB21 instrument mic to reproduce the musicality of your instruments and turn wireless into wired! Retail Price - Prix Client : 472,61 CHF tax incl.
" The sound of the accordion is one of the most complicated to reproduce, so our challenge was to create a mic pack, the Romanelli AL21, which emphasises quality, strength and ease of use. We're very happy with the outcome. With Prodipe's new UHF B210 DSP you can now play a diatonic or chromatic accordion with a wireless system. The DSP circuit is perfect for managing UHF frequencies. With DSP technology, UHF provides the type of quality you'd expect from a wired system. Relish the excellent sound balance when you play music. It's wireless meets wired. And as for the UHF side of things, the electronics have been designed to resist interference and guarantee the integrity of the signal at all times."